Filling out a report at the Tourist Police. 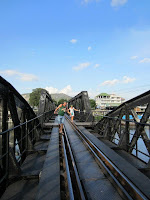 When I arrived in Kanchanaburi, Thailand my travels up to that point had progressed beautifully. I was feeling rather chipper and untouchable. 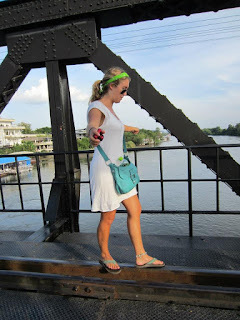 I was moving and grooving around Thailand like a pro, meeting marvelous locals and travelers, learning tons about the culture and life, and enjoying the rewards and challenges of each day. Lord knows it wasn’t all peaches ‘n cream but the good days trump the bad or should I say “frustrating” days. The school start date was continuously pushed back due to flooding which meant more travel time for me. Yay! As I’m flying high on my magic carpet feeling as though nothing could possibly go wrong, my world gets pulled out from underneath me when I least expected it and I fall from grace. The pretty courtyard at the Jolly Frog. Leaving the retirement capital of Thailand, Hua Hin, I headed northwest to Kanchanaburi feeling safe and sound and carefree. 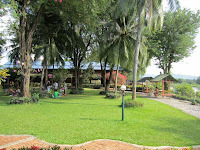 I made note of a few suitable guesthouses based on reviews and also made a memo of a place NOT to stay, the Jolly Frog. My friend Graham arrived in town before me so I sent him on a mission to find the good places I researched and check out prices and rooms. He called me a few minutes later saying he found a great place called “The Jolly Frog.” Oh hell no! I agreed to at least check it out for myself. 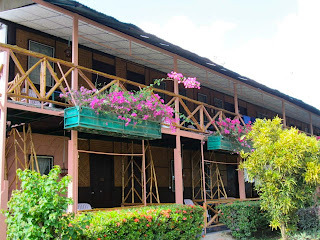 The set up was undeniably pleasant, right on the river, the room was decent, a lush green shady courtyard accompanied by cozy hammocks, and the price was unbeatable. I reluctantly agreed to stay at the Jolly Frog. Balancing over the River Kwai Bridge. 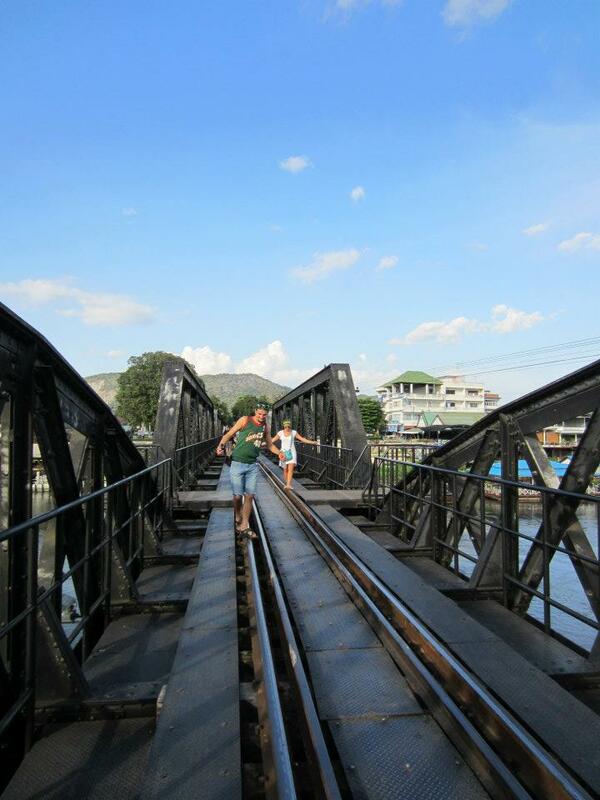 The first few hours of the trip were very enjoyable; we biked to the River Kwai Bridge and had a balancing competition over the River Kwai Bridge train tracks (I won). We were really enjoying our time exploring this unique part of history. 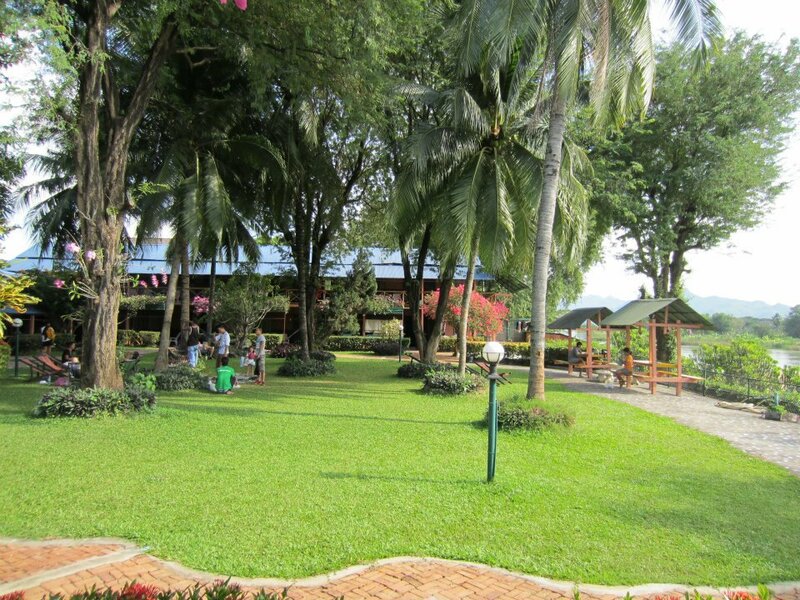 Once we headed back to the Jolly Frog, we grabbed some Thai beers and headed to the beautiful courtyard where other backpackers and even a few locals were hanging out in hammocks on the grassy lawn. I mentioned out loud to my friend Michele that I had a bad feeling about these cats because their humor was a bit rude and I felt like they were making fun of us for being Americans. We just wanted to have a friendly time and socialize! I knew in my gut it was not right. Last moments with my purse and camera. A few of us went to eat dinner together and that uneasy feeling evaporated as we talked, drank, and got to know each other. Later in the evening, we went to a bar across the street from the Jolly Frog called “Sugar Member.” I had a fabulous time there - tons of foreigners and locals mingling, playing games, and dancing. All good things must come to an end though. I headed back to the room around 3am. Graham followed shortly after. I woke up at 6am feeling an uncharacteristic chill passing over me. I discovered my guesthouse door ajar to complement a painful thumping in my head. I slammed the door closed and fell back in bed. I noticed my distinctive turquoise purse was not sitting next to the bed where I remembered laying it. Initially I dismissed the thought, my head was pounding too much to think straight, but then I thought, “Wait a sec.” Just to give myself peace of mind, “Why don’t you at least lay your eyes on it and then go back to sleep. It’s probably a better idea.” Still not spotting it I decided to get up, which was painful, and look around. No purse in sight. I walked outside to check the courtyard and zilch, zero trace of any of my possessions. Once I realized someone had been in our room while we snoozed and jacked my purse with a digital camera, wallet, REAL Ray-Bans, and a bunch of cash, my mind began to race. The scene of the crime: Bottom, left. Why was the door open? Who would do this? Was it someone we were spending the evening with? Whatever F-bag walked in here saw me all sprawled out in my nighty, who knows what else they could have done! 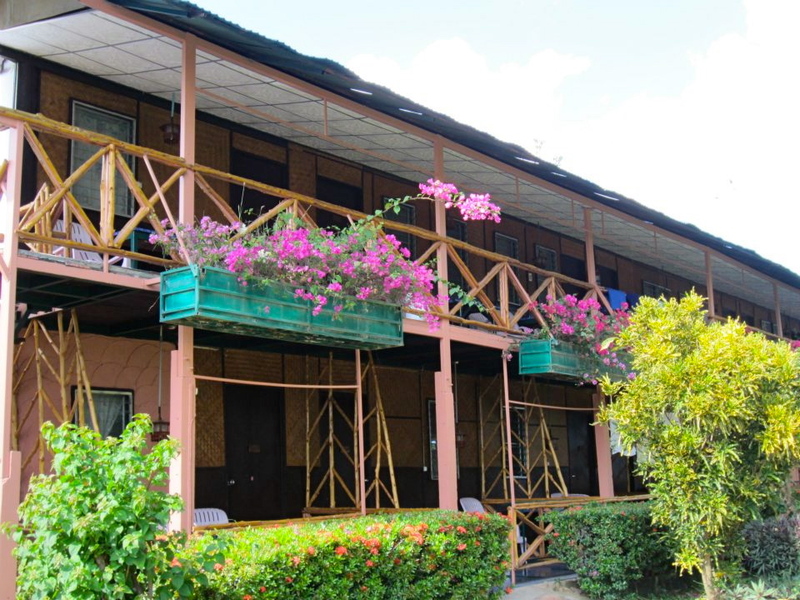 Why isn’t the Jolly Frog Guesthouse doing anything to help? Are they in on the theft? Where are the police? Why do I have this gut feeling that someone at this very guesthouse has my belongings? After asking myself the fundamental questions dealing with the situation, I began reaching deeper inside my cranium and interrogating my purpose in life. What am I doing with my life here? Will I even teach; do I still have a job? Why am I trying so hard to make life work in Thailand when it was great at home? Am I here to write or am I here to teach? Should I go back home? Not only did I lose my new camera full of photos, cash, and my only source to extract cash, but also I lost vital aspects that help me function normally. My sense of security and safety vanished. My own identity and end goal was lost in translation. Working towards a purpose is the best way I operate and as soon as the goal is indistinct I flounder. The sense of helplessness that I felt was insurmountable – the police didn’t help, the US Embassy could care less. I realized that I was completely on my own in this huge Asian continent. Mom and dad aren’t here to back you up; everything is up to you. Finding a job, apartment, your way around. It’s a sense of independence that I’ve always been obsessed with to a fault. Now it’s staring me in the face. It was an unfortunate event but it was an eye opening experience to finally get my life together and put meaning back into traveling. Signing my life away at the Police Station in Kanchanaburi. 1. DO always lock your hotel room door no matter how soon your roommates plan to return. 2. DON’T be naïve and trust everyone, you may have a fun time partying with some cool people but you don’t know their background or where they come from. Don’t be stupid. 3. DO always check to see if the guesthouse you’re staying with has a lock box in the room or at the front desk. It’s worth it if you have to pay a small fee for the day. 4. DON’T lose sight of the big picture when traveling. What is your purpose – traveling, partying, writing, etc? There are many temptations, try not to give in ALL the time. 5. DO have you bank account information and a contact number for your credit/debit card that works internationally. If your card gets stolen you can cancel it immediately before someone makes any purchases online or otherwise. 6. DON’T wait until you’re overseas to figure out how you can get someone from home to wire money in case of an emergency. This just delays the process because of the time difference plus it takes around 3 days to process anyway. 7. DO purchase insurance on your electronics. I used a company called www.worthavegroup.com and was able to get fully reimbursed for my camera. 8. DON’T forget to scan copies of your receipts, credit card, license, passport and anything you have with you. This speeds up the process when replacing stolen stuff. 9. DO get a police report from the Tourist Police or regular police. The Tourist police usually speak decent English and you never know when you’ll need the report. If you claim anything with an insurance company you’ll need a copy of the report (in English and in Thai) plus the receipt of the item stolen. 10. DON’T waste time reporting anything to your Embassy unless your passport was stolen and you need to replace it or you were hurt in some way. They don’t care and it’s usually a big, frustrating waste of time in a long line with crying babies and smelly people. Eww. Putting on a happy face for Loy Krathong. 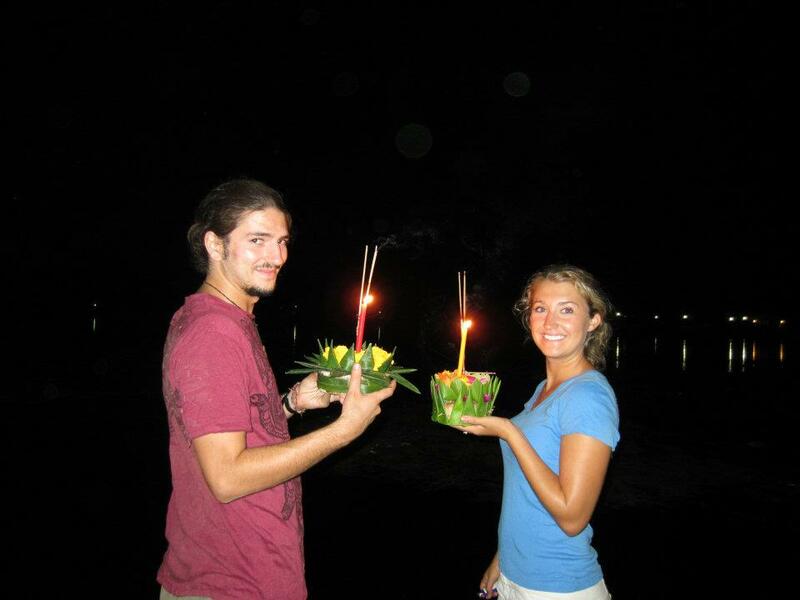 I put bad feelings on my krathong and sent it down the river. thanks girl! Craziest thing happened last night! I was at the night market in Ayutthaya for dinner and I saw the Thai girl that coaxed Graham into staying at the Jolly Frog. So bizarre, she and I made contact and I turned my head really fast and then she goes "excuse me, what time is it?" just to get a good look at me! Totally in on the robbery!! I came home and had to post this immediately! it's all good now, loving life - new camera and purse finally! !